We arrive at Sungai Nibong Express Bus Terminal, 11 km far from the city centre. Since it is already 11pm, we decide to take UBER (2.50 euros) to reach our hostel "Tido Hostel" in the centre of Georgetown. The hostel looks very nice, we are in an 8-bed female dorm. We pay € 5.60 (that is 27 RM) per night and there is also breakfast included (bread and jam). We finally get a room with a window. On the fifth floor, there is the Lounge with TV, sofas and few tables. In short, we feel comfortable right away. The only flaw is the Wi-Fi which does not work very well. The first night we are quite tired so we go directly to sleep. The following morning we start the tour of the historic centre. The town of George Town was founded in 1786 by Captain Francis Light, a senior official of the British East India Company. In July 2008 it was inscribed on the UNESCO list of world heritage sites. The recognition is due to the architectural and urban uniqueness, as well as to the cultural heritage of the centre. Indeed, it is a witness of the Seventeenth-century European presence in Asia, but also of the fusion of ethnic groups, religions, foods and cultures that have met and mixed here. Walking through the centre, we realize that we are surrounded by European, especially British, architectural structures, some of which have been renovated and transformed into luxury hotels and restaurants. We visit the Cathedral of the Assumption, the Church of St. George, the temple of the Supreme Beatitude, Kek Lok Si (Buddhist temple), the Sri Mahamariamman temple, the Moshea Kapitsn Keling, the Court structure, City Hall, Town Hall, Time Square , the Tower in memory of Queen Victoria, the St. Pier church near the ferry station and many other Chinese temples. Thanks to a local Chinese friend, we also go to a night market to taste some of the local delicacies. Finally, we visit the night market of Batu Ferringhi which offers stalls with fake items or local souvenirs. The temperature is very high and we try to shelter in the shade as soon as we can. There are 32 degrees and the humidity level is high! We continue to explore this city in search of graffiti that characterizes it. One of the most famous artists is the Lithuanian Ernest Zacharevic. 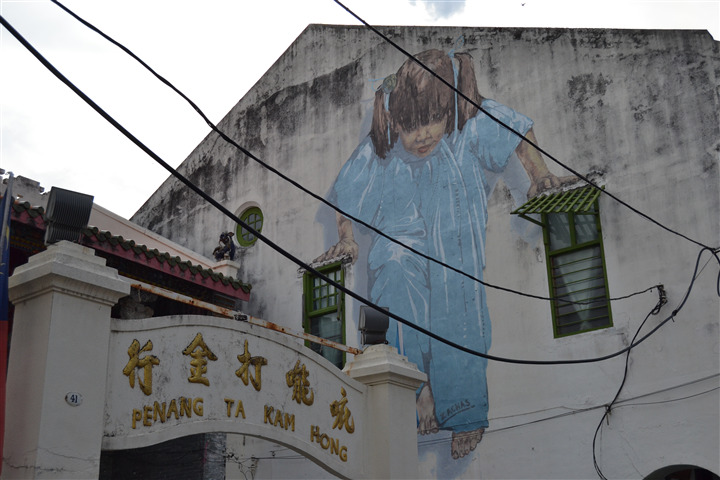 He was commissioned in 2012 by the Penang Municipal Council to create a street art project in Georgetown called "George Town Mirrors" which consisted of painting several large-scale murals in some parts of the old city. It is said that there are 9 murals painted by this artist but we could find only 5 of them. Indeed, some of them have disappeared over time. The first one we can see is the most famous: the painting shows 2 children who ride on a real bike; their happiness can be seen from their faces. Then the Reaching up in Cannon-street: it is a child on a chair trying to reach a hole in the other. There is also the one which shows a guy on a real motorbike who watches the traffic flow. The penultimate we meet is that of a child who raises herself with her arms. This mural is different from the others because of its large size. And finally we meet another mural by chance: an elderly man who is resting on a rickshaw. Georgetown street art and its murals represent characters and scenes that celebrate the energy and playfulness of life in the city centre. These murals have in fact transformed what were the normal streets into the most unusual, lively and engaging ones, appreciated not only by tourists but also by locals. 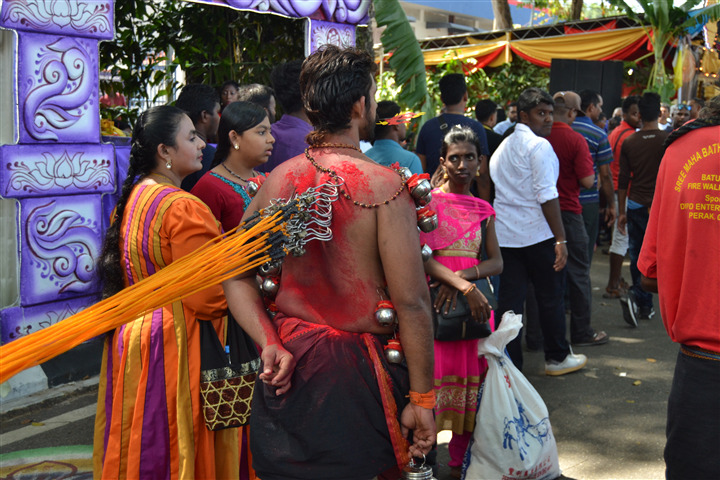 Moreover, January 31 is the day of the full moon, and precisely during this anniversary, the Thaipusam is celebrated here. It is a festival originating in the state of Tamil Nadu, India, and is celebrated in several regions with Tamil population, such as Malaysia, Singapore and Sri Lanka. Hundreds of pilgrims pierce their mouth, tongue, arms, chest or back with needles or pointed hooks from which the offerings for the Gods hang, which usually consist of fruit or containers with milk. We have witnessed this pilgrimage to the Botanical Garden of Penang. There are entire families dressed in their colourful ceremonial dresses that bring offers and dance folk dances. On the way, there are also several free refreshment points, available to tourists too. It has been truly a unique experience that allowed us to fully immerse ourselves in the traditions of this people. We've been so lucky for being able to attend a unique festival during the year. We, therefore, definitely believe that the island deserves a visit of a few days. The beach is certainly not its best part due to its position in the Straits of Melaka, but you can easily get lost among its colourful streets and a mix of scents of every kind of street food.